Home General TaDa! A Finish! This quilt has been in and out of its work in progress basket for several years. 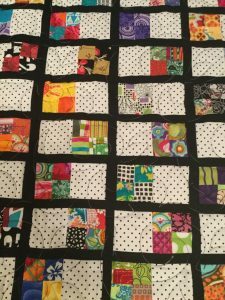 The pieces are very small – the four patches use 1 1/2″ squares making a 2 1/2″ block. But the tricky part is the sashing as it is only 1″ wide to start, finishing at 1/2″. It sure makes you pay attention to your seam allowance. I really like it now that it is finished. I quilted it with black and white variegated thread in a swirl design. 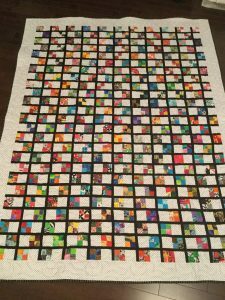 It was fun to use those 1 1/2″ squares all of which were salvaged from past projects – like a little trip down memory lane in fabric! Well, don’t those little bitty pieces add up to a lot of pretty! Very nice.